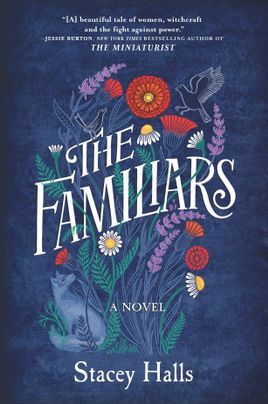 The following is from Stacey Halls' debut novel, The Familiars. Against the backdrop of the 1612 Pendle Witch Trials, the novel follows Fleetwood Shuttleworth, desperate to produce an heir and to defy the prophecy that she'll die in childbirth. She meets Alice, a witch, and their lives become intertwined. Stacey Halls was media editor at The Bookseller and books editor at Stylist.co.uk, and has also written for Psychologies, The Independent, and Fabulous magazine. I left the house with the letter because I did not know what else to do. The lawn was wet with morning dew that soaked my favorite silk rose slippers, for in my haste I hadn’t thought to put on pattens. But I did not stop until I reached the trees overlooking the lawns in front of the house. The letter I had clutched in my fist, and I opened it once more to check I hadn’t imagined it, that I hadn’t drifted off in my chair and dreamed it up. It was a chill morning, misty with the wind racing down from Pendle Hill, and though my mind was in turmoil I’d remembered to take my cloak. Nobody noticed me, and the only servant I saw was a glimpse of James at his desk. The idea that he might have read the letter himself crossed my mind, as a steward often opens his master’s correspondence, but I dismissed the thought quickly. The clouds were the color of pewter jugs that threatened to spill over, so I hurried across the grass toward the woods because they were a good hiding place, and I needed to think. I knew in my black cloak I’d be conspicuous in servants’ prying eyes at the windows. In this part of Lancaster, the land is green and damp, and the sky wide and gray. Occasionally you see the flash of a deer’s red coat, or a pheasant’s blue neck, and your eye is drawn swifter than they can disappear. Before I reached the shelter of the trees, I knew the sickness was coming again. I pulled the hem of my skirt away, then used my kerchief to wipe my mouth. Richard had the laundrywomen sprinkle them with rose water. I took deep breaths and felt slightly better. The trees shivered as I went deeper, and in less than a minute I had lost Gawthorpe altogether. While the house couldn’t keep you from the woods, which seemed to draw ever closer, visible from every window, the woods could keep Gawthorpe from you. Sometimes it felt as though they were playing a game. You can divine without difficulty the true nature of the danger that your wife has been in, and it is with solemn regret that I impart on you my professional opinion as a physick and expert in matters of childbed: that upon visiting her last Friday sennight, I drew the deeply unfortunate conclusion that she cannot and should not bear children. It is with excessive importance that you understand if she finds herself once more in childbed, she will not survive it, and her earthly life will come to an end. Now out of sight of the house I could react, my heart beating furiously. Another surge of sickness overcame me. The other three times I hadn’t been this ill. This time it felt like the child growing inside me was trying to escape through my throat instead of between my legs like the others who announced their untimely arrivals in red rivers down my thighs. “Not long for this world, the poor mite,” the last midwife said, wiping my blood off her butcher’s arms. Four years married, three times in childbed and still no heir to put in the oak cradle my mother gave me when Richard and I married. Still, I could not fathom that Richard knew what the doctor had said and had watched me fatten like a turkey at Christmastide. The letter was among papers from my three childbeds, so it was possible he missed it. Would he have done right by me withholding it? Suddenly, the words seemed to wrap around my neck, written by a man whose name I did not recognize, so wreathed in pain was I when he visited that I could not recall a single detail about him or whether he was kind. I’d not stopped to catch my breath, and one of my slippers had come off. I made the letter into a ball and threw it as hard as I could, taking satisfaction when it bounced off a tree yards away. If I had not done that, I might not have seen the rabbit’s foot, nor the rabbit it belonged to—or at least what was left of it: a mangled mess of fur and blood, then another, and another. I hunted rabbits; these had not been slain by a hawk or falcon making a neat little kill. Then I noticed something else: the hem of a brown skirt brushing the ground and knees bent and above them a body, a face, a white cap. A young woman was kneeling not ten feet away, staring at me. Every line of her was alert with an animal tension. She was shabbily dressed in homespun wool. Flax-colored hair spiraled down from her cap. Her eyes were large, their color unusual even from a distance: a warm gold, like new coins. There was something fiercely intelligent, almost masculine, in her gaze, and though she was crouched down and I standing, for a moment I felt afraid, as though I was the one who had been discovered. Another beast dangled from her hands, one eye resting on me without blinking. Its fur was stained with red. On the ground a roughly hewn sack lay open. She got to her feet but remained perfectly still, her expression unreadable. Only the dead rabbit moved, swinging slightly. She began bundling the rabbits into her sack. My crumpled letter lay pale among the massacre, and she paused when she saw it, her fingers hovering, stained red with blood. “Give it to me,” I snapped. She held it out and in a few quick strides I’d snatched it from her. Those golden eyes did not leave my face, and I thought a stranger had never looked me at so hard. “Your land?” Her tone was accusatory, or surprised, her accent local like my servants’. “I am not,” was all she said. She lowered her eyes. I could not guess her age. Then my eyes fell on hers, and her gaze met mine, level and proud. I frowned and raised my chin. In a flash of gold and brown she turned and ran through the trees. Her white cap flitted between the trunks, the sack bouncing against her skirts. Her feet thudded, quick and deft as an animal, before the woods swallowed her whole. From The Familiars. Used with permission of MIRA Books. 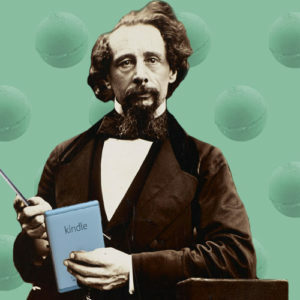 Copyright © 2019 by Stacey Halls.